I've been gearing up for the JAWA Chic show in Bridgeport (Chicago) next month (Oct. 19-30) at the Zhou B Arts Center. I'm excited for the show. The idea of the show is to present art jewelry at an elevated level. The pieces will be displayed on the wall as if in a gallery. I have also considered my pieces to be miniature sculptures, especially the rings. I create with this always in mind. Art jewelers put as much time and thought as traditional artists and therefore I believe they should be given the same respect. 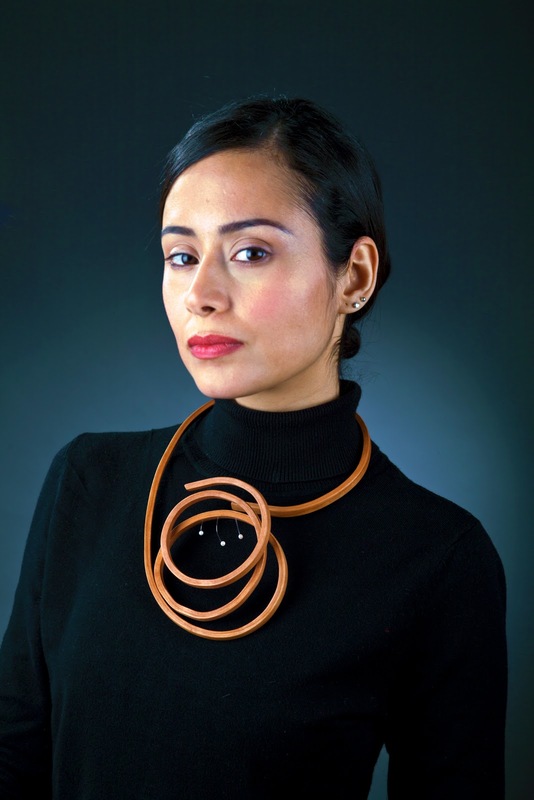 The Held Neckpiece - $350, handmade in Chicago. At a recent street festival in Chicago, I noticed many bulging eyes after checking out the price of the work. It's ok, I'm used to this reaction. I am confident in the craftsmanship with which my work is created and I believe in a balanced exchange of energy. Those who connect to that energy understand. Later, a lady came up to the booth, and said, "I'm happy to see that you've priced your work according to the amount of time and energy you put into it." Wow! I was so pleased. She happened to be a maker herself. She understood that it takes time, energy, focus and dedication to create. It's hard to place a value on that. Good friend and fellow artist David Forlano will be displaying his work as well.